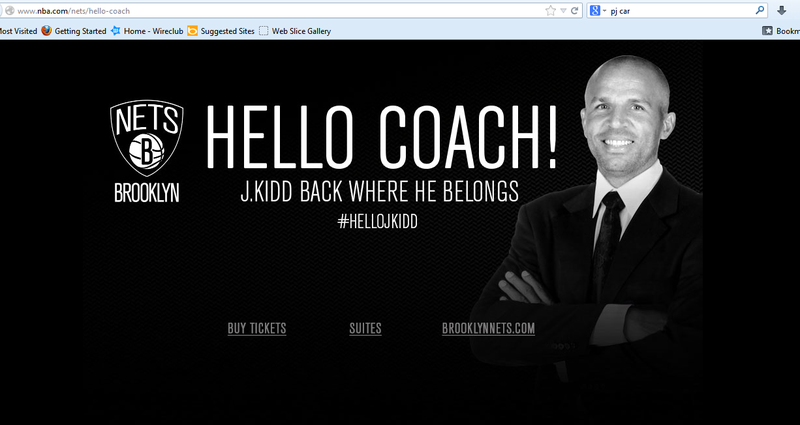 A screenshot of the Nets’ official Web site. So far, things are peachy in Brooklyn. With no coaching experience but a Hall of Fame career as a player, Jason Kidd is an intriguing hire for the playoff-caliber Nets. Today I wanted to make some predictions on what he’ll change in Brooklyn. As a team, Brooklyn held their opponents to 95 points per game, which ranked sixth out of 30, but their pace (28th out of 30) was so slow it hid their average team defense. Their defensive rating was 103.6, per NBA.com, which ranks in the middle of the pack at 19th. They allowed the third-fewest attempts from three-point range, according to HoopData, but were in the top ten in field goal attempts allowed at the rim, a number that reflects on both interior defense and on the perimeter. Let’s hope the renewed enthusiasm in Brooklyn will inspire Williams to actually try on defense, because he completely mailed it in last season. His effort had slackened his final couple of years in Utah as well, but last season reached another level. Synergy rated him one of the worst point guards in the league at that end, and opponents ripped him for an 18 PER, according to 82games.com. This should not be happening. Williams isn’t the most laterally fleet player in the league, but he has good size and decent quickness. With proper effort, he should at least be a league-average defender. It didn’t happen this season, either. According to NBA.com, the Nets allowed seven more points per 100 possessions when Williams was on the court. That increase, from 97.5 to 104.7, is the difference between the third-best defense (the second-best Memphis Grizzlies had a defensive rating of 97.4) and tied at 22nd with Toronto. Meanwhile, other highly-paid players like Brook Lopez and Joe Johnson either had a slightly positive or negative net rating on defense, but nothing as drastic as Williams’ on/off court numbers. Note: From the looks of the NBA.com advanced statistics page, those statistics only go through 63 of the Nets’ games. It’s possible Williams’ numbers defensively have improved over the last 19 games of the season, though even the biggest improvements would still leave Williams with a negative net rating when it comes to his defensive numbers. So what could Kidd change about Williams’ defense? At least in the twilight of his career, Kidd, a member of All-Defensive teams in nine different seasons, relied on proper positioning, quick hands and using them to time where his opponent held the basketball, and team defense. Though Williams is in the prime (rather than near the end) of his career, those subtle improvements can go a long way especially with team defense regarding defending the pick and roll, rotating properly, etc. A ton goes into team defense though and it doesn’t require just Deron Williams to put in maximum effort. Everyone on the Nets needs to put in the effort on defense if they want to get out of the first round next season. One of the rifts between Williams and (at least) coach Avery Johnson was that Johnson was too controlling with the play calling down the stretch of games. Though Johnson and Kidd were both former point guards, they played difference styles under different coaches. I’d like to think that Kidd will have more trust in Williams making the right decisions and be given more room to dictate what plays to call within the flow of the game. It might not happen to begin the season, but I think eventually it will come. If the Nets’ franchise player can trust Kidd and vice versa, that effect will trickle down through the rest of the roster. Brooklyn’s offense averaged 105 points per 100 possessions, good for top ten in the league. If only they played faster to take advantage of it. Like stated earlier, Brooklyn was third-worst in terms of pace. They were dead last in terms of pace when they lost, per NBA.com. Similar to what I stated before, it would only make sense for a player like Kidd–who thrived in fast break opportunities—to push the ball with someone as solid as Deron Williams running the point. This shouldn’t be a surprise. No coach is perfect and neither should Jason Kidd, who has zero NBA coaching experience coming into next season. Even if he does make the right decisions, the results will say otherwise from time to time. It will be a growing, feeling out kind of process to start, which made the hiring of Kidd all the more confusing. This is a playoff-caliber squad and one with (unrealistic) expectations that Kidd will coach next season. For someone who has no prior coaching experience, I’m not so sure Kidd was the best hire. Other coaches can get the best out their players in both the regular season and the playoffs, but not many are in that group. Maybe Kidd eventually finds his way there, but it’s unfair to expect him to do so right away or even during his first head coaching contract. Who knows what Nets owner Mikhail Prokhorov expects out of this roster next year though. If it’s a championship–and it probably is–then he’ll be disappointed. The 2013-14 season will be Kidd’s first year in the NBA without the ball in his hands, but he has the potential to be one of the better coaches in the league. It didn’t happen overnight with former point guards like Mark Jackson, Nate McMillan, and Doc Rivers. They all needed at least one season to get their feet wet. If Kidd can get the most out of this Nets roster (Williams specifically) and make them more than just a first-round playoff exit, he’s already on the right path to success as a coach.